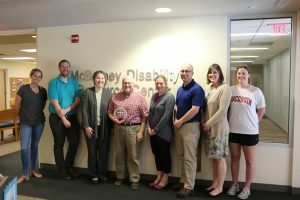 The McBurney Disability Resource Center recently celebrated 40 years on campus. 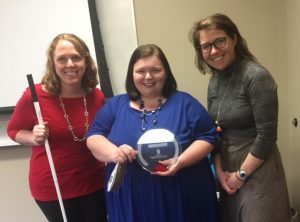 As part of the celebration activities, the office took time to recognize some of our critical campus partners who are contributing to an inclusive campus community for students with disabilities, by presenting eight individuals with the inaugural Forward in Access Awards. 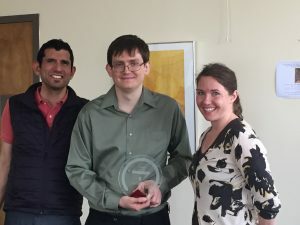 The Access Awards are a celebration of individuals who support and contribute to access at the UW–Madison. The McBurney Center alone does not make the university accessible. The team relies on every member of the campus community, and recognized eight individuals who have made exceptional contributions toward creating and maintaining an accessible and inclusive campus environment. Read on to learn why these individuals were nominated and recognized. 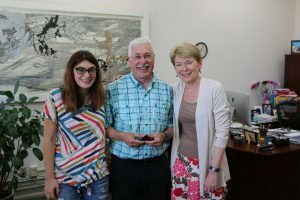 Nominators share that Professor Rosengren went above and beyond when working with ASL interpreters in one of his classes this Spring (2018). His overall attitude, demeanor and personality were incredible to work with. Staff wished all faculty could respond with the concern and respect that he did in providing accommodations. Interpreting requires a little more communication between providers and professors in preparing for access in the classroom. They describe working with Professor Rosengren as a breath of fresh air where they felt a mutual respect and common goal as professionals. While his efforts made ASL interpreting more effective, the most important impact he had was on the student. The respect for and positive interactions with the Deaf student will be something they never forget. Giving them the one-on-one time they needed was empowering. By listening to their struggles and why the course was challenging, Professor Rosengren’s teaching was truly inclusive and the material much more accessible for the student. 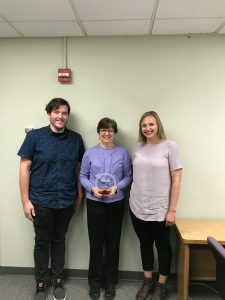 Nominators share that Allen’s passion and focus on creating and maintaining a group specifically for individuals on the autism spectrum met a need that has long been desired by that population on campus. In providing a space for meaningful conversations, Allen’s efforts lead to personal growth, introspection, and acceptance of self for students on the spectrum. He created a level of comfort and rapport with group participants naturally and softly challenged them to be their best selves. The impact of this sense of community has empowered students to be open and feel validated in their individual experiences. Being the driving force behind starting the group AS WE ARE speaks loudly to Allen’s overarching goal of empowering students on the spectrum and advocating for a person-centered, non-pathologizing view of folks on the spectrum, and reminding us all that individuals on the autism spectrum are not broken. Allen is an outstanding communicator and role model, not only for UW-Madison students on the spectrum. He truly leaves a lasting impression and increased knowledge about what it means to be accepting, inclusive, and a critical thinker. Nominators share that Fortney has done an excellent job of smoothly coordinating accommodated exams at the Testing and Evaluation Center. Fortney not only arranges many exams for students well in advance, but also he is able to meet the numerous amounts of late requests, helping to ease anxieties for many students with exam accommodations. His willingness to create a smooth process for those late requests has allowed accommodation specialists in the McBurney Center to be efficient in making requests and following up with students. This has been a key aspect in providing accommodations, including that of flexibility for students who need to reschedule exams due to flare-ups in their condition. 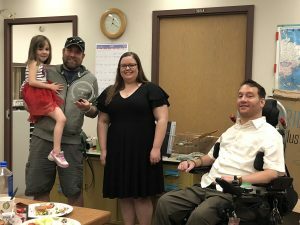 While the Testing Center was originally meant for students needing to take exams in alternative formats, Fortney’s dedication for accessibility has now opened doors to students with other test accommodations. This has allowed for a simple and straightforward provision of accommodations by many faculty, thus having a huge impact in making our campus accessible and inclusive. Truly, Fortney’s ability to accommodate and make testing accommodations happen in many unusual situations, in addition to the typical request is noteworthy. Document Conversion requests are very cyclical with tall peaks. Community volunteers like Sadicario help ensure that students with print-related disabilities receive quality services on-time so that they can be full-participants in their classes. His efforts working on books, journal articles, and other materials that are not currently available in an accessible form are essential in gaining access to material for students who require a more intensive level of conversion. 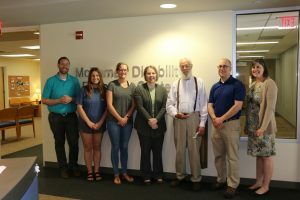 Nominators share that McQueston’s design of an inclusive online course incorporated aspects of Universal Design for Learning (UDL) and intentionally built-in flexibility to the course. She has gone out of her way to accommodate students whose needs and disabilities required additional individualized accommodations that were not able to be covered by the well-designed course. By harnessing aspects of UDL in multiple means of expression, McQueston allowed students to choose what works best for them. Additionally, she offered broad deadlines and broke down work for students. The set up of this online course allowed students who may otherwise have had a difficult time completing coursework and demonstrating mastery of the material, to learn the material. Previously, McQueston also worked closely with a student, faculty, and cooperating teachers in setting up a plan for flexibility during student teaching, which essentially became model of communication and creativity for other student teaching practicums. The interactive process in which McQueston engaged has been applied to numerous student practicum experiences for students with flexibility, allowing future teachers to feel confident about managing disability in very specific and stressful environments. Nominators share that Hamers has been instrumental in ensuring equal access to students in the Chemistry Department. By helping to streamline the process for implementing testing accommodations, Hamers created a more uniform process for students and makes it easy for McBurney students in any chemistry course to access their accommodations. She has been a wonderful resource whenever our students have questions or concerns, often directing them to proper resources to ensure our students succeed. Most note-worthy, Hamers has provided individualized services and advocated 1:1 with and on behalf of students. She has gone out of her way to reach out to students, faculty, and TA’s to implement the difficult accommodations of flexibility and group letters. Additionally, Hamers has brokered conversations between Chemistry and other departments on campus when individualized and creative alternatives have needed to be devised for students with chemical sensitivities. With Hamers on staff, McBurney Center accommodation specialists rarely have to assist with chemistry accommodations. She consistently strives to make the Chemistry department accessible to all, and her liaison-ship with our office is greatly appreciated! Document Conversion requests are very cyclical with tall peaks. Community volunteers like Stockhausen help ensure that students with print-related disabilities receive quality services on time, so that they can be full participants in their classes. His efforts working on books, journal articles, and other materials that are not currently available in an accessible form are essential in gaining access to material for students who require a more intensive level of conversion. 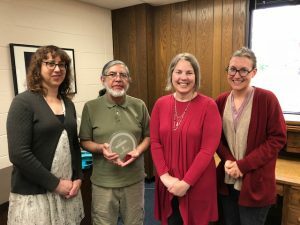 Nominators share that through Peralta’s concern with supporting captioning in the classroom, he created an environment that was welcoming, supportive, and allowed for the greatest access. Peralta went out of his way to provide prep materials and to be in communication with the CART provider in case anything more could be done to support CART in the classroom. As the class coordinator, Peralta facilitated communication between the service provider and the teaching professors and made providing CART an incredibly smooth process. His efforts helped ensure the best possible captioning could be provided to a hard of hearing student.